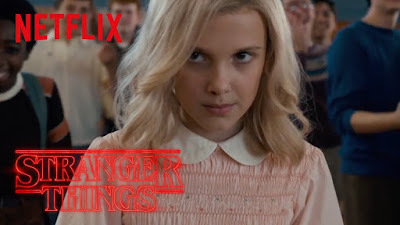 This is a new video from Netflix that uses footage from season one of Stranger Things to create an NES style video game experience. It is also reminiscent of some of the scenes from Scott Pilgrim vs. the World. The new season will premiere on Netflix on the October 27, 2017. Finn Wolfhard, Millie Bobby Brown, Gaten Matarazzo, Caleb McLaughlin, Natalia Dyer, and Charlie Heaton are confirmed to return this season. They will be joined by Paul Reiser, Brett Gelman, Linnea Berthelsen, Dacre Montgomery, Will Chase, Rob Morgan, and Sadie Sink. "It's 1984 and the citizens of Hawkins, Indiana, are still reeling from the horrors of the demagorgon and the secrets of Hawkins Lab. Will Byers has been rescued from the Upside Down, but a bigger, sinister entity still threatens those who survived."